Lovely two-room apartment furnished with fine furniture and finishes. Located on the first floor with private entrance; composed of 1 double bedroom, open kitchen to the living room with dishwasher, washing machine, fireplace, TV, DVD, music amplifier for IPad or similar, bathroom with shower and 2 balconies. Very nice, quiet and welcoming. The indicated prices include electricity and water consumption. The heating is autonomous, the use is to be considered excluded from the tariffs. No pets. No smoking. The apartment was clean, well equipped and very comfortable for two people. The hiking in the area was wonderful. Cogne village with shops and restaurants is lovely and just a few minutes by car but not practical to walk to due to the steepness of the road. Cristina was very helpful with suggestions for walks and restaurants. We very much enjoyed our week stay here. Beautiful Mountain View from a very comfortable and quiet apartment. This apartment is in an area where there are lots of good hiking trails. The views were spectacular on every hike we went on. The apartment itself has comfortable furniture for lounging and a well equipped kitchen. It is neat and very clean. There is a big screen TV with 3 news programs in English for those rainy days. Cogne and it’s surrounding villages are all charming and traditional. There is a small grocery store in Cogne but a nice big super market on north side of Aosta to do your main stocking up. There are also a couple of shops/cafes in Cogne where you can get pastries. Also several restaurants and pizza places available. The apartment owner Cristina is great for communicating with if anything needs to be taken care of or to answer any of your questions. Over all we really enjoyed our stay! This snug apartment in a tiny hamlet is beautifully designed and decorated and very comfortable. 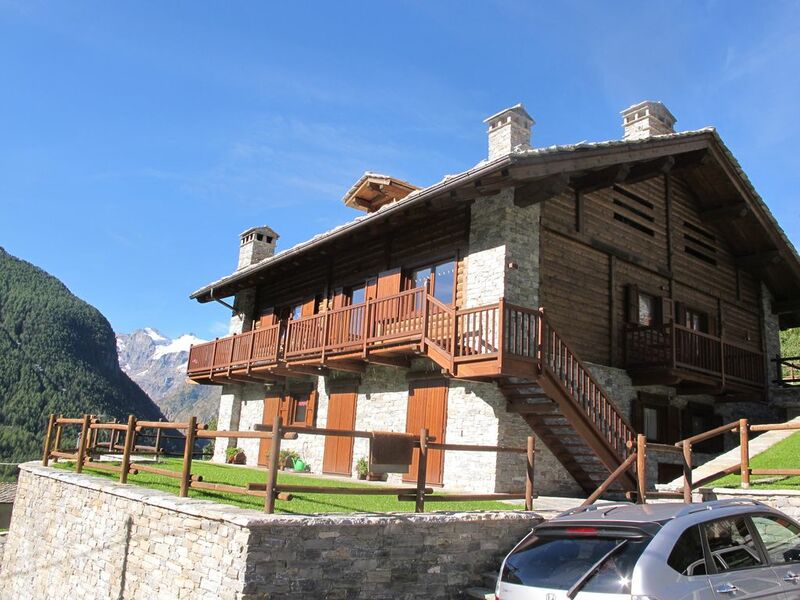 It offers the perfect base for exploring the mountains around Cogne. The Gran Paradiso National park is aptly named - it is stunning! Our favourite hike was the Lago de Loie circuit; after a stiff climb you enter a natural wonderland with breathtaking views, and watch out for the shy but very cute marmots! Cristina was very welcoming and helpful, and even made a restaurant booking for us. Highly recommended. A perfect place to stay in the hamlet of Montroz. We were lucky enough to have stayed here for the month of February to enjoy the winter activities of the area. The appartment was lovely; very comfortable and cosy; perfect for the two of us. The appartment was even more enchanting than initially indicated by the advertisement's photos. The facilities were as described; all very clean and in good order. The log fireplace was a real treat on those colder winter evenings! The owner was very attentive. She made us feel very welcome, making sure that everything was fine for us. Highly recommended. Logement conforme aux photos et a la description de l'annonce. Bien décoré, très bien équipé, au calme. Bien situé, a proximité de Cogne et du parc Gran Paradiso. Nous avons passé une excellente semaine. De formidables randos a faire a proximité. Cristina répond très vite a nos questions. Wunderschön und liebevoll eingerichtet, sehr ruhige Lage! Ferienwohnung ist sehr gut ausgestattet, einziger Nachteil: ab nachmittags gibt es keine Sonne mehr(Ende August), dafür kann man ein Feuer im Kamin machen. Toller Ausgangspunkt für Wanderungen! Nel caso di affitto stagionale, il prezzo verrà concordato al momento.